These lightweight solar panels are portable and easy-to-use while producing the solar energy you need. Electrical Information: Peak power: 80W Solar cell efficiency: 17% Maximum power voltage: 18V Maximum power current: 4.44A Open circuit voltage: 21.24V Short circuit current: 4.89A Power allowance range: +/-3% Maximum system voltage: 500V Values at standard test conditions: Air Mass - AM1.5, Irradiance - 1000W/m2, Cell Temperature - 25°C. Can be installed and used with your electric car, camper, food truck, boat, yacht, delivery vehicle or street food cart. Great for use while traveling. 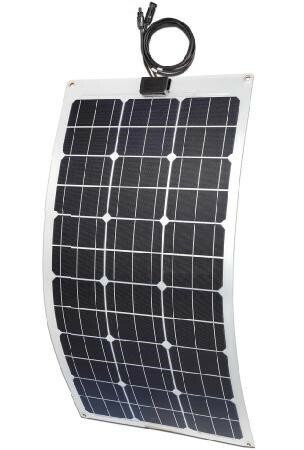 Portable, thin and flexible solar panels are lightweight and incredibly durable solutions for non-traditional solar panel needs, such as powering your electric bike, electric moped, e-scooter, radio, laptop, smartphone, travel refrigerator, DJ equipment, Bounce House, event and /or on site construction equipment. Flexible solar panel two years workmanship warranty, other products one year warranty. Solar cells are guaranteed to produce at least 90% of nominal power in 10 years and 80% of nominal power in 25 years.